If you regularly experience bruxism (habitual teeth grinding and clenching during sleep) and the unpleasant symptoms that go along with it – including headaches, jaw pain, and worn-down tooth surfaces – a custom-made nightguard can provide valuable protection. Your team at Torrington Dental Care will personalize your new nightguard so that it fits comfortably within your mouth, helping to prevent any harmful contact between the rows of teeth that may occur while you sleep. Why Choose Torrington Dental Care for Nightguards? Bruxism is actually a fairly common problem—as many as 1 in 3 Americans experience it at one point or another in their lives! The most prominent cause tends to be daily stress, though dental issues such as a misaligned bite or strained TMJ (jaw joint) can lead to grinding as well. 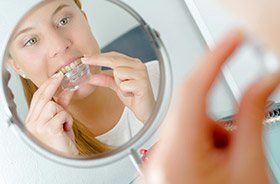 Fortunately, a nightguard can be designed for all of these situations to provide the protection a patient’s smile needs. Do you suspect that you’re a victim of bruxism? Please let us know so that we can evaluate your condition and help you achieve much-needed relief in Torrington, CT.